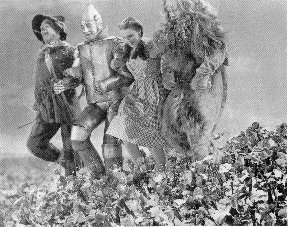 "We're Off to See the Wizard" (a .WAV file). 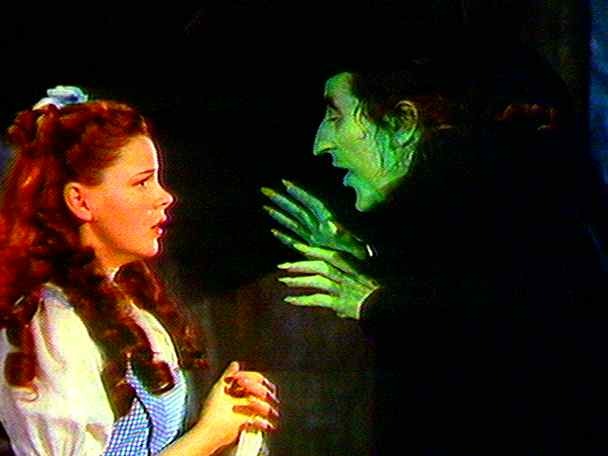 But the Wizard sends them to bring him the broomstick of the Wicked Witch of the West, so off they go through the Haunted Forest to find the witch's castle. "I'd turn back if I were you." -- The Sign. "I do believe in spooks! I do believe in spooks! I do, I do, I do, I do..." --The Lion. 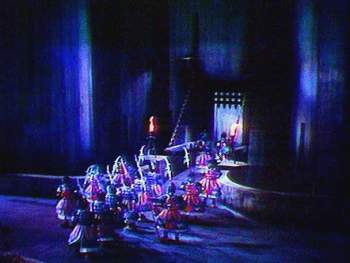 The Winkie Guards at the castle of The Wicked Witch of the West. "Ooo - eeeee - ooo!" "Fool that I am. I should have remembered -- those slippers will never come off, as long as you're alive. But that's not what's worrying me. It's how to do it. These things must be done delicately... or you hurt the spell!" --The Wicked Witch of the West.